Classic Performance Products announces the introduction of its brand new 1962-67 MINI Sub-frame Kits. Eliminating the factory strut rods, adding adjustable forward control arm mounts, these kit add stability, improved steering response and over 2" of ground clearance for your early Nova. By eliminating the bind of factory strut rods you are able to maintain proper alignment with out the use of a "Lock Out Plate" and gain a free working up and down motion in the lower control arm. The results are better ride quality and positive road feedback. 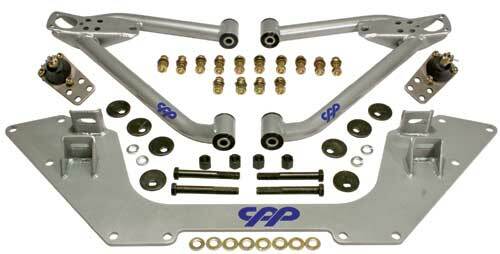 CPPs kits accommodate both the factory sway bar and aftermarket 1" bars (aftermarket 1-1/8 bars will not work). The one-piece crossmember ties both frame rails together by bolting in where the factory strut rod mounts were located, providing additional strength. It also adds only 2 lbs to the car after removing the heavy factory strut rods and bulky strut rod mounts. There is no cutting or welding required. The rear of the lower control arm mounts in the factory location and the original camber adjustments are used. The front of the lower control mounts to the new crossmember and adds a forward caster adjustment to guarantee a perfect, simple and hassle-free alignment. The standard kit (#6267TCA-K) includes 2 one-piece 1-1/4" 120 wall DOM tubular lower control arms, simple bolt-in 1/4" thick steel cross member with forward mounting, 4 alignment cam kits, grade 8 hardware, and CPP's low friction, long life bushings and CPP's new premium lower ball joints. Our deluxe kit (#6267DTCA-K) comes complete with standard kit, upper control arms, coil springs, rubber spring perches and shocks. 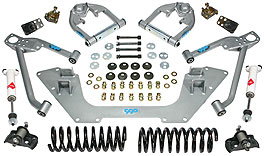 Please specify stock height or 1 ½ drop coil springs and black or silver arms when ordering this kit. The newest kit (#6267TCA-ULK) also includes our brand new upper control arms.